This entry was posted in Embroidery, Stitch Guides, TAST and tagged Bullion Knot, Bullion Stitch, Chain Stitch, Composite Sitiches, embroidery needles, Pin Tangle, Ribbon Embroidery, samplers, Sharon Boggon, Stem Stitch, Take a Stitch Tuesday, TAST by Julie. Bookmark the permalink. 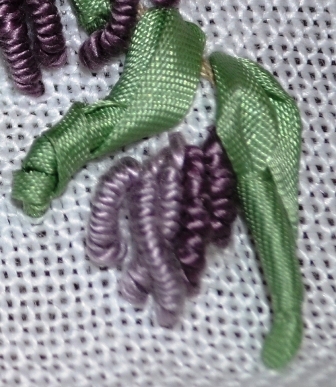 I think you have made great use of the shape of the stitch for the Wisteria. I guess the most common bullion flower is the Rose. How about Daisy petals, Bulrush and the centre of an Anthurium? The Wisteria is in bloom in Japan right now, so I adore your entry for TAST Week 20! I’m not familiar with Bulrush and Anthurium. Will have to look them up! Thank you!